The 5th annual European League Against Rheumatism congress, held in Berlin, 9–12 June 2004, was attended by a record number of delegates from all continents and offered a large choice of education, state-of-the-art and original research presentations in up to 15 parallel sessions. Some of these were poorly attended, although featuring top-ranked abstracts. The poster sessions remain a problem child. They were not well attended by viewers and largely neglected by presenters, mainly because of the general structure of the meeting. Ways to improve this could be to provide lunch packages and to appoint poster session chairmen. Other changes would involve moving morning hour satellites to other slots. However, in general it was an enjoyable meeting showing important progress in various fields of rheumatology and meeting the expectations of most delegates. This European League Against Rheumatism (EULAR) congress started like its forerunners with an opening ceremony at the end of the first day of the congress. It had been preceded by 12 parallel scientific and educational sessions followed by several drug industry satellite symposia. Hall 1 of the conference center boasts that it is Europe's largest venue of its kind, seating 5008. It was well filled but there was plenty of space for the latecomers. The ceremony started 15 minutes late; the reason given was that the musicians were out smoking (!). But then all went to schedule, and the Dvořák melodies were pleasant and not too long interludes between talks. The president talked in a relaxed and statesmanlike way about the burden of disease and the Alliance Against Arthritis, which was launched by him with active support of the Bone and Joint Decade in Brussels in March of this year. One aim is to convince the European Union that research money should be earmarked for rheumatic diseases in analogy to what is done with cancer and diabetes. The German minister of education and research responded favorably to this and said her government did realize the importance of this initiative. The awards were duly presented, and it was gratifying to see Kimmo Aho from Finland receive the Meritorious Rheumatologist award for his lifetime achievements in research (Fig. 1). The recipient was particularly pleased that his wife finally could appreciate why he had always been late home during the past 50 years. The ceremony ended with a surprise. The stage wall disappeared and behind it a mini Brandenburger Tor opened the way to the buffet reception in the adjacent hall. The president and the minister were the first to walk through the Tor. There were unlimited supplies of food and drink, and mingling conditions could not have been better. 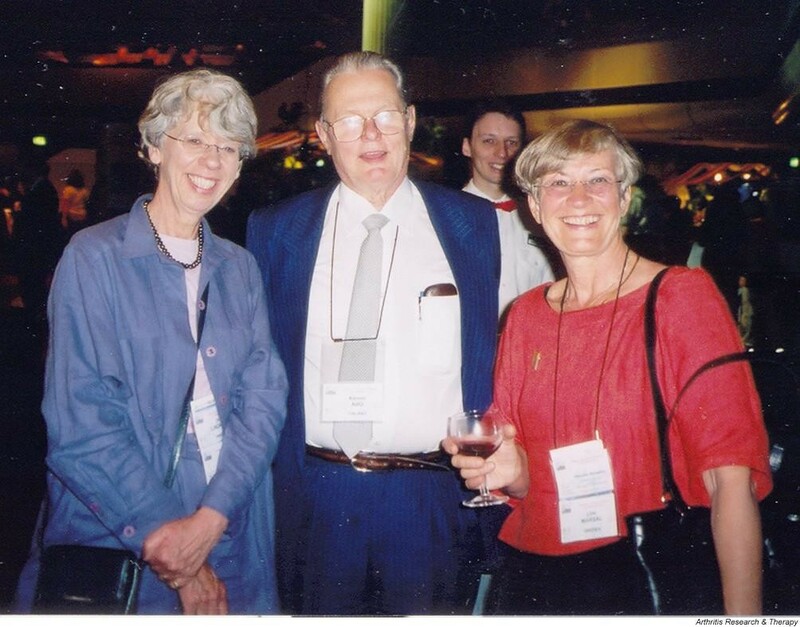 Kimmo Aho (Helsinki, Finland), recipient of the 2004 "Meritorious rheumatologist" award at the opening of EULAR 2004, flanked by Ylva Lindroth and Lida Marsal (Malmö, Sweden). The cost for the venue in Berlin is substantial. Hall 1, where the opening took place, can be rented for the handsome sum of €17,880 per 12 hours. Fortunately the congress had over 9000 delegates paying between €800 and €1000 depending on the time of registration. This again included a one-year subscription to the EULAR journal Annals of the Rheumatic Diseases, and also access to all educational events, unlike the American College of Rheumatology (ACR), which charges extra for these benefits. The biennial Scandinavian Congress of Rheumatology held in August 2004 charged €450–600. So in comparison €800 is expensive but not outrageous. €7,200,000 was of course not the only revenue for EULAR. There were 22 industrial satellites this time and a large number of commercial exhibitors. No doubt this event is generally accepted as the major marketing event of the year in Europe, if not worldwide. Judging from this, EULAR is in good economic health. The secretariat in Zurich consists of only three individuals: Fred Wyss, the executive director, Ernst Isler, the congress coordinator, and Mrs Elly Wyss, the education program coordinator and accountant. One must admire the efficiency of this secretariat and congratulate EULAR on having such an able managing team. After 20 years in a small office, the EULAR headquarters will next spring move into its own more spacious venue in Zurich. Berlin has an excellent public transportation system consisting of underground, city trains and buses. A one-day 'Pass partout' costs €5.60. So wherever you were staying it was easy to get to the International Congress Center (ICC). Arriving from the underground one easily could get the impression that the ICC was an extension of the U-Bahn system with all its narrow passages and directions to countless halls and rooms at numerous levels, sometimes connected by stairs, sometimes by escalators, sometimes only by elevators. Moving around was good prophylaxis against deep vein thrombosis and the 'ask me' personnel were very helpful. Security, surprisingly, was a problem. I met a couple of Swedish colleagues who had lost their wallets inside the ICC, and told me that they were not the only ones. To make a fair judgment on the podium sessions, one would need a committee of some 10 individuals who divided the sessions between themselves. I attended some excellent sessions, the quality of which could not have been better at any other meeting in the field. An example was the 'Advances in scleroderma' session, with several presentations of new material, both basic and clinical. The room, Hall 10, which seated perhaps 200, was full. People were standing along the walls of the room and the discussion was lively. The session ended on time only because one presenter of a drug study was not present. It was interesting to note the strong frontline research results presented by Swiss and Italian investigators. In contrast, I attended part of a top abstract session called 'Cutting edge rheumatology' in Hall 1, where the opening ceremony had been held. There were perhaps 50 individuals in attendance, and both chairmen and presenters must have been disappointed at this demonstration of lack of interest from the 9000 delegates. Where were they? Some no doubt were travelling between Berlin's many superb museums and other sights, but those attending the ICC had a choice of 15 parallel sessions at the time. My advice would be a radical reduction of the number of parallel sessions at future EULAR congresses. This would reduce the need for chairpersons. The redundant manpower could be used for chaired poster discussions, for example. It makes sense to stage top abstracts in a mixed topic session, but then one should give the session features of a plenary. The ACR has for years practised this at their annual meetings, and the plenary sessions have often been dominated by novel and outstanding presentations and lively discussions. One or two such sessions should be feasible at the annual EULAR congresses and would add distinction to the scientific program. The structure of the meeting was similar to that in Lisbon last year which I was not entirely happy about . This year the congress venue was adequate, although because of its size and complicated architecture one was never quite sure where in the compound one was located. In Lisbon the industrial exhibitions had the prime location and were separated from the scientific posters. This was not the case in Berlin, where posters occupied the walls and the exhibits the middle of a number of long halls. These surrounded a courtyard with the Funkturm in an arrangement reminiscent of a huge medieval castle. The good intention was no doubt that the proximity of the exhibits should stimulate delegates to visit the posters as well. This did indeed work pretty well at the EULAR meeting in Stockholm in 2002. The air-conditioned premises in Berlin were pleasant and when I visited them during the poster sessions lasting from 12.15 to 2.00 p.m. there were plenty of people. However, most were busy visiting the exhibitions. There you could engage in a variety of interactions, usually ending in the handing out of some gimmick or publication and bag with a fitting logo. My impression was that fewer than one in ten of the posters had a presenter in presence. I met also some fairly irritated poster presenters who upon arrival at 8 a.m. were unable to set up the posters. The exhibition area was still closed and opened first at 9.30 a.m. From 8.15 to 9.45 a.m. every day the only official activities were the satellite symposia, and delegates should perhaps not be tempted to view posters during that time. Similarly, the exhibition area closed at 4.30 p.m. when the afternoon satellites started. The number of posters was about 480 every day. Is there really so much new material worth presenting? It depends on whom you ask. Several posters I recognized from last year's ACR meeting. There were also poster presenters who had more than one poster to present simultaneously in different areas. Obviously you can only appear in one place at a time (Fig. 2). Eric Matteson (Rochester, MN, USA) discussing a poster with Carl Turesson (Malmö, Sweden) in front of one of the few manned posters in Berlin. The effort involved in producing a good poster is not trivial. I remember the headaches and fights preceding the Stockholm EULAR by its president, Lars Klareskog, to make sure that the poster sessions would be well attended and that the panels would get enough space. Handling costs for submitted abstracts are not negligible. EULAR has the commendable ambition of attracting young investigators to present their research to the critical eyes of older colleagues. Most accepted submissions will be presented in poster form. To make this a meaningful exercise, both presenter and viewers/discussants must obviously meet. Such encounters did not happen much in Berlin, and – to be honest – most big meetings are not very successful in this sense. One could ask whether the poster sessions should continue at all. In previous years at the ACR there were 2 hours every morning reserved for sponsored breakfast and poster viewing, and these hours were always very stimulating. The posters were manned not only by the first author; often senior people from the same group were present. One was 'taken through' the posters and could ask nice or nasty questions: it was fun and alive. I experienced both sides, and when presenting I always got useful comments. Admittedly even the ACR sessions are no longer like this. So what could be changed? Younger and brighter brains must have struggled with this problem. I can see a few possible strategies for future meetings: (1) eliminate the poster sessions altogether; (2) reduce the number of poster presentations; (3) create several themed poster sessions, each with a discussion leader; (4) restructure the whole EULAR meeting to improve opportunities for viewing posters. The elimination of poster sessions would be a radical Gordian knot solution and it would eliminate a lot of useless work and frustration. Submitted and accepted abstracts would be either podium presentations or published in the abstract book but not actually presented. Authors who need to show some sign of active participation would thereby be identified, and email or personal contacts with other investigators might follow. There are difficulties with a more restrictive policy of selecting abstracts for poster presentation while maintaining the overall structure. The rejected submitters might be discouraged from attending the meeting or from submitting the following year. This would not happen to the same extent if there were no posters. Abstract grading is not always easy: the abstract writers' formulation skill might vary, the reviewers' bias might influence selection, and so on. The third possibility would be to accept groups of themed abstracts and lump 20–30 of them into predefined actual poster sessions at which a discussion leader would give each presenter three to five minutes to present the essentials, whereupon questions could be asked for some minutes. Several such sessions could be arranged, for example lasting 2 hours. They would take place in front of the posters, and chairs could be provided. This format has worked well at recent smaller meetings I have attended, but would probably be impracticable at a meeting of this size. However I am informed that this format has been very successful even at a recent meeting of EULAR size. This would be my favorite recommendation. 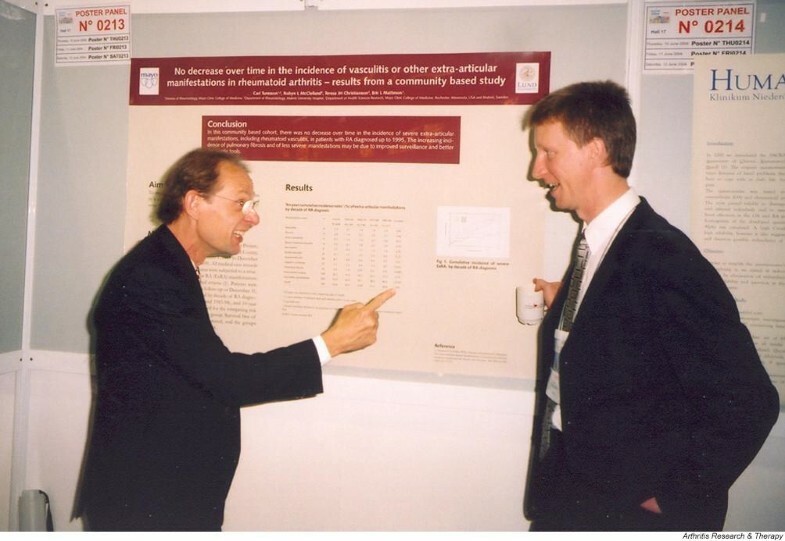 So what could one learn from the successful poster sessions in Stockholm in 2002? Probably the provision of free lunch boxes in the poster area, fewer posters and perhaps less attractive industrial exhibitions contributed. The lunch box option would be worth considering next time. And assigned chairmen would be equally important. A stricter policy of accepting only abstracts of unpresented and unpublished work would also be healthy. I not only noticed several 'old' posters, but also listened to some podium presenters telling the meeting of published drug trials. The annual EULAR congresses are now established along with the ACR meetings as the most important congresses in our specialty. This is attributable to the vision, skill and dedication of the EULAR leaders in recent years. It is good for rheumatology and helps in implementing recent therapeutic advances. The strength of EULAR carries possibilities as well as dangers, among them the issue of conflicts of interest. Good relations with industry must not interfere with credibility and the building of equally good relations with patients and authorities. From what I could see, EULAR is performing well in balancing between interests, and it is using money gained by the congresses for good purposes. In 2004, EULAR is spending €765,000 on education and professional development and in 2005 this figure will be €1,700,000 (Fred Wyss, personal communication). Among these is a visiting professorship program. One should never change a winning team. But there is always room for improvement. The heart of the matter rests with the relation with industry. Congresses are industry, and industry is driven by profit. The congress organizer must make money. EULAR's main source of income is the surplus. The drug and other product industry provides most of the money and must be convinced that this money is well spent and will satisfy stockholders. It would be hypocritical to deny the fact that the present structure of the annual EULAR congress is not the result of a compromise between EULAR and industry. The result is 2 × 1.5 = 3 hours of industry time and 2 + 1.5 + 1.5 = 5 hours of proper congress time per day. The 1 hour and 45 minutes for poster sessions and lunch and exhibitions can be considered neutral or divided. These proportions can be considered fair or unfair, but the result is that the congress program is compressed in time and expanded horizontally, with attenuated audiences and disappointed presenters. I would urge the planners to concentrate future satellites on the time after 4.30 or 5.00 p.m. and during periods before and after the meeting. This would give two additional prime morning time sessions for the congress program. If the time for the podium sessions cannot be expanded, the organizers need to reduce the number of sessions. The aim of covering every subject every year is untenable. The featured top posters deserve prime exposure at the EULAR meetings, perhaps chaired by the program committee chairman or some other. But the issue of allotting prime satellite time on both mornings of the two main congress days must be reassessed. In the end it would perhaps be to the advantage of both EULAR and its industrial partners.